Yesterday I visited Mr Aheairy (56) and Mdm Sharipah (61) with some friends. 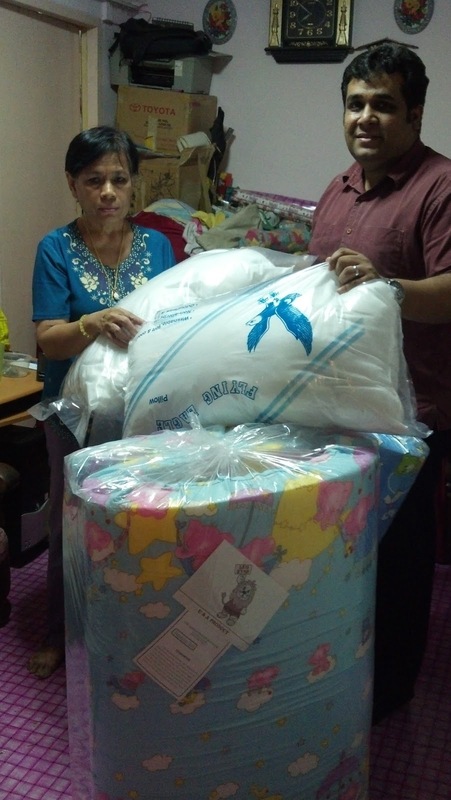 Their family was recently affected by the fire in Lorong 6 Toa Payoh (link: http://bit.ly/KuyfdS). The Minister for National Development and the mainstream media have told us that the story of the recent fires are one of irresponsible occupants leaving leaving bulky items at lift lobbies and common spaces. The actual story is more than that. Mr and Mrs Aheairy are now staying in Mr Aheairy's daughter's rental flat. Mr Aheairy's daughter and her husband together have four children. The flat is not even sufficient to accommodate this family of six. Mr and Mrs Aheairy only sleep in the living room, but they have no place to store their personal belongings in the house. Which was why they had to place it in the common space outside the lift lobby. Mr and Mrs Aheairy's personal belongings including their clothes, mattresses, pillows, letters, etc, were all burnt in the fire. They have had very little help from anyone to help them cope with the incident. Yesterday Mr Aheairy went to see their MP Zainudin Nordin to seek his help to appeal for a rental flat for him and his wife. He claims that it was probably his tenth time appealing to HDB for a rental flat. According to them, HDB has rejected their appeal because they do not qualify for a rental flat according to HDB's own criteria; and HDB has replied to them that Mr and Mrs Aheairy can stay with their children. Mr Aheairy's 3 children (including the one they are living with now), all live in rental flats with their own families themselves, and are constrained by space to accommodate their parents. The town council has also now fined the couple a total of $150 (since the fire on Sunday), for leaving their bulky items and bicycle (which the couple need to ride to their place of work in Potong Pasir). Mr Aheairy recently found work as a full-time cleaner and for the last two months have been drawing a salary of $1300. He previously could not find full-time employment and was drawing only $700 per month. Mdm Sharipah is recovering from a surgery in her foot. Leaving bulky items at lift lobbies and common spaces may not be the only cause of the recent fires. Lack of appropriate housing and space for Singaporeans - especially Singaporeans with lower income - may also be a reason. Today, I brought some mattresses and pillows to give to this older couple, so that they don't have to sleep on the hard floor in the living room.